We begin with the plan. This is my latest sketch of the garden, with South being at the top of the page (this is backwards from usual maps with North at the top, but it's how we approach the house so it made more sense to start the drawing this way, and now I'm stuck on it). Starting at the front sidewalk, I'll lead you through the map. I was torn about what to do in the space between the street and the sidewalk, which gets a lot of rough treatment from passers-by and especially their dogs. Finally I came up with the idea of all native plants, on both sides. So I moved my other garden plans back a couple feet into the front yard and now I have room for a decent swath of interesting plants (with no need for water!). I've ordered a few dozen bare-root roses for this season. My plan is to plant them along the front as a hedge, arranged in increasing darkness of pink. Yes, I am aware of how obsessive that sort of thing is in a garden, and of how this pretty much guarantees that all the roses of a particular colour will die a horrible death and I will have big gaping holes. Humour me. My big rose planting peeve is that it drives me nuts to see roses set out as if the garden were a nursery rather than a garden. So I will be making a thick hedge. I admit, I was first attracted to this tree because it's the name I called my brother when he was little. But it's a lovely tree, too. 'Jon-Jon' grows to about 12-20', which is perfect for our front yard. I'm planning a small brick patio around the tree, with places to sit and talk to the neighbors in the evening. One of the things we love about this neighborhood is how nice all our neighbors are, and we wanted a garden that focussed on the street as well as a private space. Nothing says Victorian House to me like big fluffy hydrangea. They tend to do best against a North-facing wall around here; our neighbors have one that gets too much sun and is struggling. So using them around the base of the front bay seemed like a great idea. They'll also conceal the gas meter and water shutoff. I have a moral objection to paying for crabapples at the store (at the prices they demand) just to make them into jelly. Also, crabapples are very decorative trees, so I put this one in a prominent spot. I had never considered quince until we were house hunting years ago and came really close to making an offer on a house with an overgrown quince in the back yard. Noel waxed rapsodic on quince jam. So here we are today. We're planting two quince: one with curly branches that is primarily decorative but happens to give usable fruit, and one for eating (or making into jam, really). Quince can be eaten fresh, but they are hard as rocks. So you need to slice them thin and serve them with cheese. You may wonder if it's a coincidence that two rather unpleasant fruits are planted on the public side of the fence. It is not. Other fruit-tree-growing friends often find people picking their fruit, so I decided that if somebody really wanted to pick it, they can eat as many quince as they can with their remaining teeth. I'm a sucker for weeping forms, and weeping flowering cherries most of all. And over a path? Pure romance. I haven't decided on this one yet, mainly because I've been preoccupied with all the fruit. Passionflower vines are lovely as decorative plants, and some of them produce fruit, so why not combine the ornamental and the edible? Asian pears really backed me into a corner. The variety I really wanted (Hosui) needed Nijiseiki as a pollinator, and then I remembered Shinko, so I was stuck with three pear trees. This was the problem that lead me to find out about high-density planting. I added Shinseiki, an early fruiter, on a whim while placing my order; I've had them and they are good, and pears in July will be nice. I'd already decided on planting Jonathan (a great pie apple). We tried and loved Akane and Belle de Boskoop at a tasting. W. W. Pearmain is an old apple, and one I have liked in the past. Plus, it fit into the ripening schedule. There's a tree next to the apples that I haven't decided on yet; at this rate it may end up being more apples. The nice thing about the high-intensity planting is that you don't get as much fruit from each tree, so it's totally practical to have eight apple varieties in your yard. Or so I keep telling myself. There are both white nectarines, which I prefer for their flavour. Yellow nectarines have the advantage of not showing bruises from handling, but we don't have that to contend with. Did you know nectarines are just naked peaches? Now you do. This is a pink-fleshed navel (a sport of Washington, which gets sweet in our area). I like pink fruit. A great orange for cooking, very useful and also just neat to look at. These are deadly expensive in the store, and unripe, too. Have I mentioned that I like pink fruit? (actually, these will be in containers somewhere in the paved area) Because who does not love mandarins? To your right now is another quince. You also just passed a lilac, but I have to decide which one I want. There are some low-chill varieties that do well here. A good friend has one of these in her garden, and it is a great cherry for cooking. Noel wanted a Black Tartarian, but it needed a pollinator (or two). So, not knowing much about cherry varieties, I picked these based on what others have said of them and when they come ripe. June will be awash with cherries. We're both blueberry fans, and nothing beats a really ripe blueberry right off the bush. We had some of these at a friend's house, and they were just amazing. Not cloyingly sweet but light and crunchy. I've talked about my shed. This is where it will go someday. Until then, there will be a bougainvillea hedge (to give a warm pointy welcome to the local miscreants who think it's a great idea to climb over the back fence) and a lawn for the dogs. Everybody who sees this says, "You're putting in a pond for your dogs?" as if it is a mad idea. They obviously do not have two Labradors, because a dog pond makes perfect sense to me. The pond will also have non-dog areas for lilies and lotus, and some goldfish to keep down the mosquitos (and because I love goldfish). I have the compost heap here, and we're planning to put a water tank here (so we can use the sump ouput in the garden rather than dump it in the storm drain system). I'd also like to have some chickens (you can have up to six in Alameda) and this is where I would keep them. They could turn my compost and add guano to it at the same time. If you move to the far left side of the garden, you will find yourself under another pergola, wooden this time, and attached to the fence (which we are planning to rebuild at some point). Noel asked me to grow him some hops for beermaking. Easy enough, but I'd already kind of filled the yard up. So I stuck them here on the pergola, where they may or may not get enough sun (this end of the pergola gets shaded by a neighbor's tree). 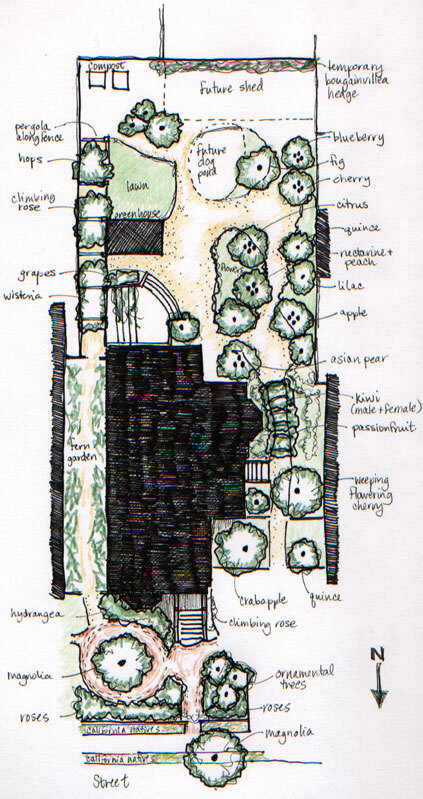 I visualised this space as a quick route to the compost heap, and a buffer between our yard and our neighbors'. Right now there is a Cecile Brunner climbing rose on our side of the fence, and also the neighbors' wisteria mounting a vigourous campaign to take over the world via the fence. We've been planning to put in a greenhouse. The plans have reached mythical proportions, but I keep putting it off because there's no time to do the foundation right now, but it will happen this winter or spring. It's an 8'x12' greenhouse, and we're going to use it for hot peppers (they don't get enough heat in Alameda), the mandarins (heat makes sweet), and a coffee tree (because I am a loving and indulgent wife). We can also sit there in the winter when it's chilly in the garden, but still beautiful outside. Right off the back of the house we're planning to build what is actually a relatively small deck. That will open off what will become the dining room (and is now the kitchen and our only functional bathroom, so obviously this is some time in the future). I'm planning to grow some table grapes here. Either from the grape seedlings I've been nursing along, or a purchased variety. I probably won't plant anything any time soon, on account of not yet having the deck. Brugs are well suited to this climate, and they produce an intoxicating aroma at night. I put one right next to the future deck so we could appreciate it. This tree is actually growing in a pot right now, but it should be ready to transplant next summer. The alley between our house and our neighbors' is dark and tends to be somewhat damp (though that will change with the sump in operation year round). Perfect for a fern garden. We're planning to put fences and gates at both ends so it can be shared space. A perfect way for their three dogs to come over and visit our two (and cause all sorts of havoc). I'm really looking forward to having this space look less terrorized, and I've been propagating ferns like mad. So that's it: a quick tour through the garden plan. I'm sure some things will change as we plant and things grow in, but there's a fair bit of flexibility in there. I expect the time when I'll really be regretting this plan is when we have to dig all those holes for all the trees I just ordered for this winter. January is going to be very busy, I think. Wow, great design! I especially love the dog pond. I'm not sure which is harder, coming up with a great design or actually planting it. You have really put a lot of thought into this and I hope you are richly rewarded. Enjoy the journey! I think I can say with great certainty that the planting portion of the process is much more labour-intensive. The design itself just seemed to happen from the "program" we had for the uses we wanted from the garden. Impressive, thanks for the tour! Watch out for those hops, I hear the vines like to grow 25 feet long, though maybe the shade will slow them down. Decided on varieties yet? I'm guessing something English, like Kent Golding or (my favorite name) Fuggle? I hear Willamette's a good choice too, it's a strain of Fuggle that's much easier to grow, if I remember right. Take care.